One of the planned improvements slated to be installed was a front disc brake conversion kit. There are problems with the rear disc conversion, so it has to wait. But, rebuilding the front suspension provided the perfect time to convert the front brakes. A lot of time was spent in researching a good disc brake conversion kit. The solution had to be cost-effective and relatively straight forward to install. There are a large number of kits and manufacturers that could be used, but many of them were prohibitively expensive. Most reasonably priced kits would improve the existing braking quality. 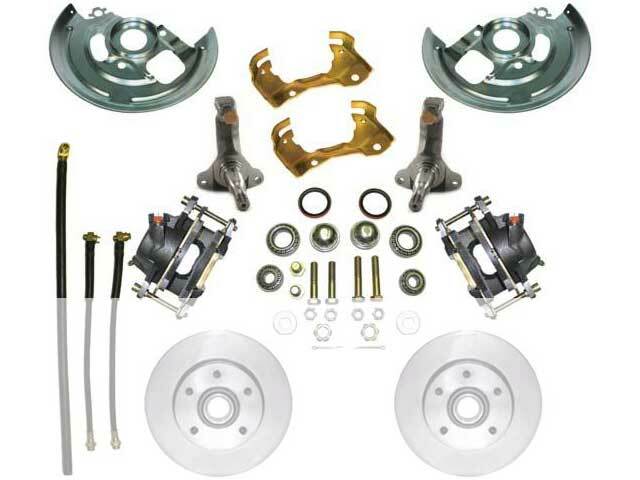 I found, and selected the FAB Quest conversion kit for a 1968 to 1972 Chevy Nova. Since the current modifications to the Spitfire's front suspension uses Nova spindles, this would be a direct bolt on effort. I ordered kit upgrades of braided brake lines and slotted and drilled discs. 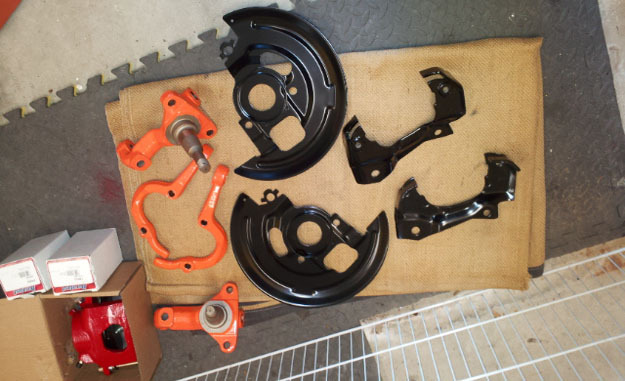 I had the disc brake components powder coated in black and bengal orange to match the color scheme of the rear suspension. The kit was ready for installation - just waiting on the installation of the a-arms and the new shocks with coil over springs.